Just because boys love cars and trucks and girls gravitate towards princesses and pink doesn’t mean their bedrooms have to reflect that. Designing a child’s bedroom in good taste from the get-go will allow them to make the transition from terrible twos to tweens and even teens without spending a fortune along the way. And better yet, their rooms will flow more naturally with the rest of the house instead of looking like something out of Romper Room. Have some fun creating a haven for the little ones with all the amazing choices out there. There’s nothing wrong with pink as long as it’s done sparingly like this aesthetically pleasing girls bunk room courtesy of Coastal Living. 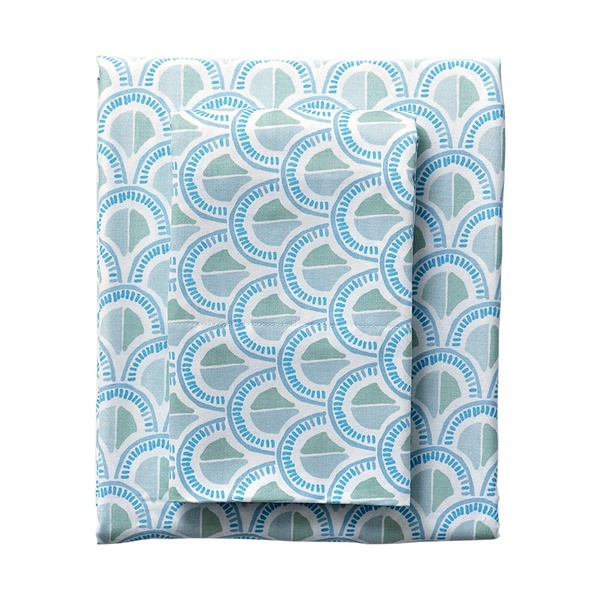 Curtains in Raoul Textiles‘ Amijao in sea. 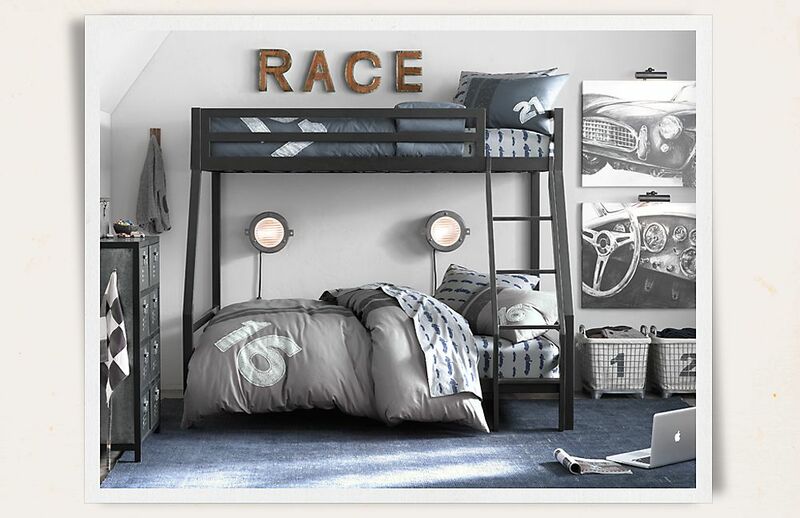 Bunk beds can be space savers especially when you need to accommodate siblings with limited space. 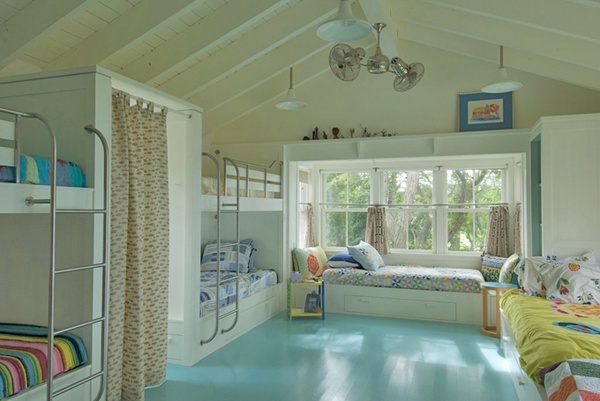 This beachy bunkroom relies on ocean hues to create a fun atmosphere for slumber parties. The aqua painted floor is a perfect play area and bunk beds allow for lots of friends and family to sleep over. Interior design by Andra Birkerts. This neutral bunk room is stylish and gender neutral and the flowing curtains give each resident some privacy thanks to the mother-daughter team of Southern California’s M. Elle Design. 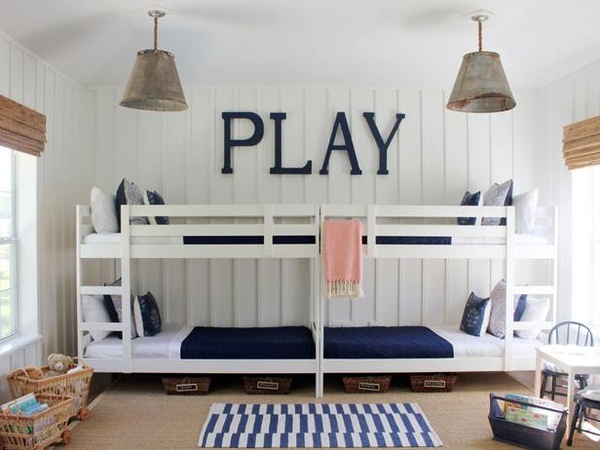 A playful bunk configuration in a room clad in white board walls and woven accents is pure class. Industrial bunk beds from the new Restoration Hardware, aka RH, are sleek and modern — a far cry from the Brady Bunch days. 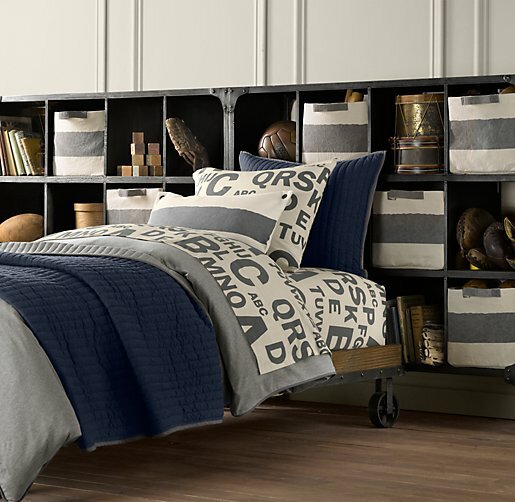 Their industrial cart platform bed is a clever idea and the walled storage is a great way to organize toys. With many older homes lacking adequate storage, shelves over the bed serve an important function of displaying books and special toys. Arrange in like colors for an artistic twist. A window seat and built-ins are a good way to take advantage of the wall and provides extra seating. 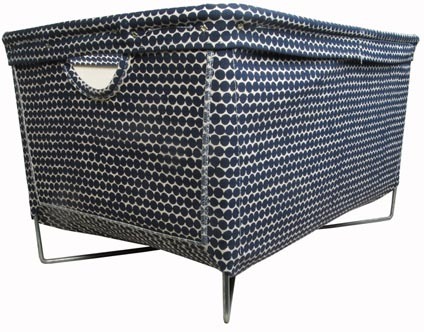 Hable Construction makes underbed storage boxes and hampers stylish and functional. Designer Jenni Kayne’s Los Angeles playroom is simple with neutral tones and a fun teepee for secret playdates. Photo courtesy of Architectural Digest. 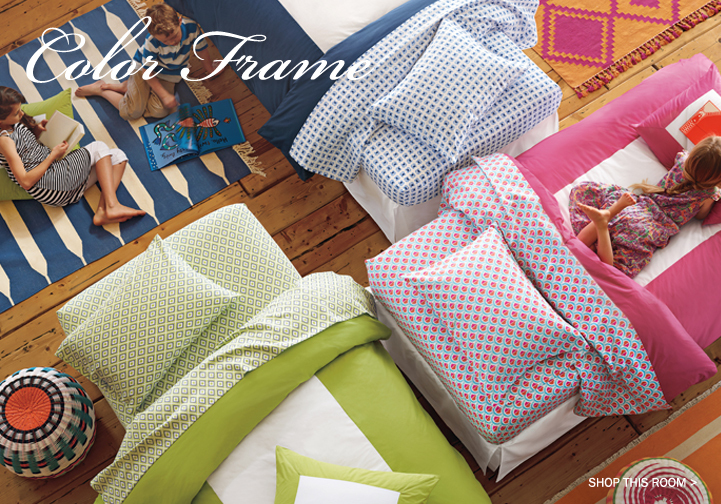 Bedding can also instantly help define the decor of the room. Serena and Lily makes colorful sheets in interesting patterns. Their cool, blue Celadon scale sheets give a bedroom a coastal vibe without overdoing it. Interesting accessories can also keep your child’s room from looking like pre school. 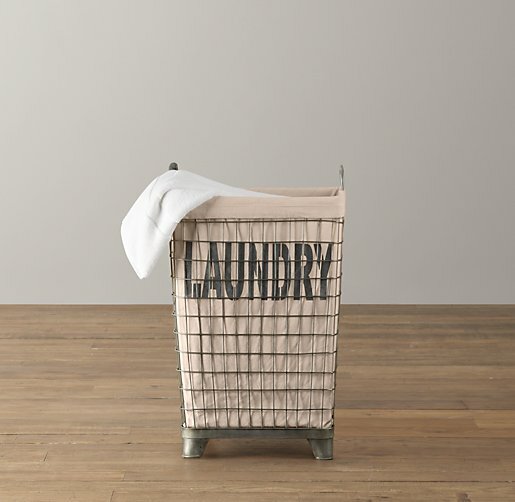 How about throwing the dirty clothes in this industrial hamper from RH? 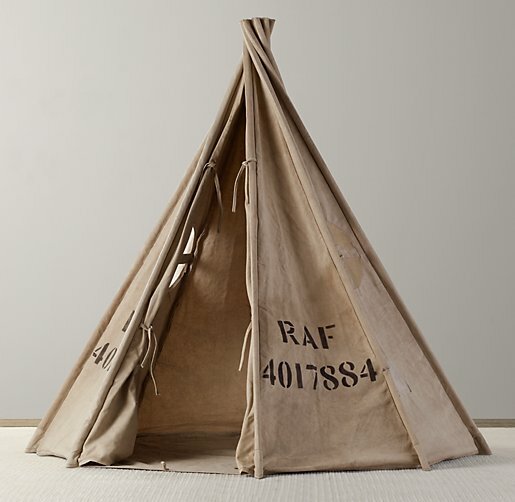 This canvas tent from RH looks vintage and would make a great hideout or sleepover quarters. 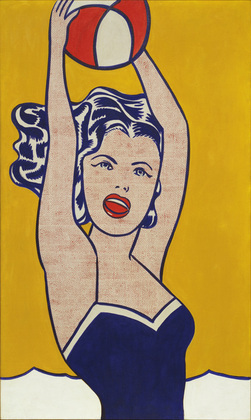 Retro artwork like Roy Lichtenstein’s Girl With a Ball adds a little bit of playful sophistication. 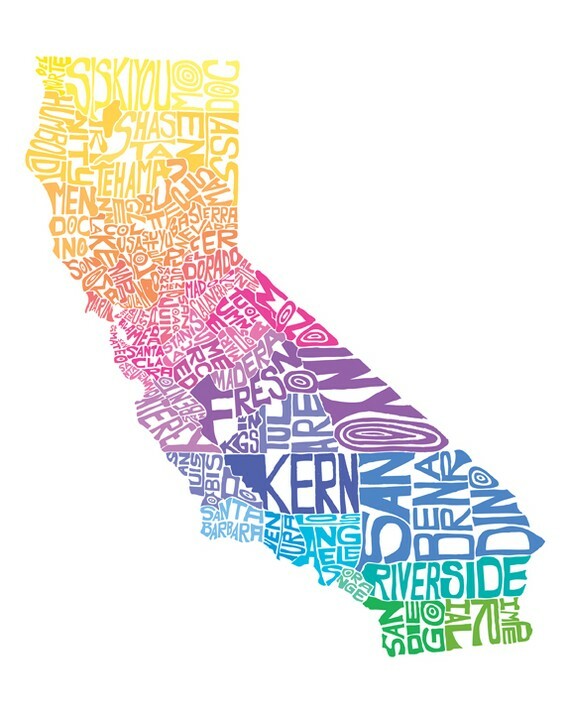 Or California counties reinterpreted by CaPOW on Etsy would make a statement in the playroom or over the bed. Stop playing it safe! Let the kids grow up with good design.